One on the most useful tools you should have in your DIY toolbox is a caulking gun, you can use this gun for a variety of sealants from silicone sealant to decorators caulk. These guns usually come in two sizes, a small or large, I think its always worth getting a large gun so you can use all sizes of tubes, large guns will take tubes of 380ml and cost around £4-5. Decorators caulk is a flexible sealer / filler. It is used to fill gaps around skirting boards, door architraves, window and door frames cove / cornice and ceiling / wall line and anywhere there maybe movement. Once the decorators caulk dries it remains flexible and moves without cracking, unlike traditional powder fillers. To use decorators caulk isn’t difficult and once you get the knack its easy. The first thing you will need to do is remove the nozzle from the tube, then take your knife and cut the top off of the tube (be careful), next you need to cut a small amount off the end of the nozzle, cut this at about a 45° angle, don’t cut too much off, you want the end of the nozzle about the same size as the gap you’re filling. You can always cut more off of the nozzle if you need to later. Now screw the nozzle onto the tube and put the tube into the caulking gun. 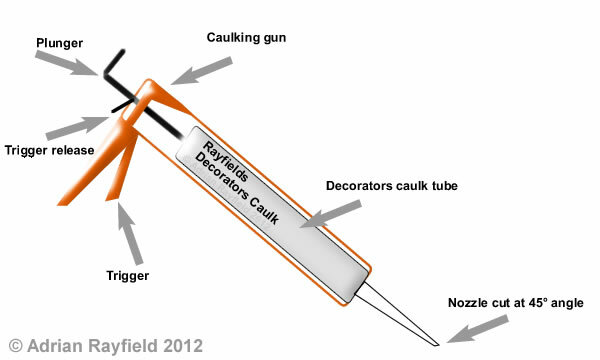 Once you have the tube and nozzle prepared and loaded into the gun you’re ready to apply the caulk. Gently squeeze the trigger until a little caulk comes out of the nozzle, you are now ready to apply the decorators caulk. Place the nozzle at the beginning of the crack or gap you’re filling, gently apply even pressure to the trigger as you move the gun along the gap, you will leave decorators caulk along the crack or gap, once you reach the end, remove the gun and release the trigger release lever to stop caulk from continuing to run out from the end of the tube. Now take a damp good quality sponge (so it doesn’t leave bits in the caulk) or a wet finger and rub it along the crack / gap you have just applied the caulk too, this will push the caulk into the crack but also smooth it out. If you need to apply more because you have missed a bit, do the same as you have just done. Now you have filled the crack or gap you need to let the decorators caulk time to dry and set, this could be as little as an hour but this depends on how wide and deep the area you have filled. Once dry, decorators caulk can be painted over, wallpapered and lining papered over, but can not be rubbed down. Once you’re done you can clean up by using water to wash hands and sponges, take the decorators caulk out of the caulking gun and put a nail or screw in the end of the nozzle, or wrap masking tape of the nozzle to prevent the caulk from drying out too much in the nozzle and tube. Now store the tube in your shed or garage but protect from frost and extreme temperature as this may affect the caulk. I have done a review on a caulk that doesn’t crack or craze, I have been using it for a while and the results are good. 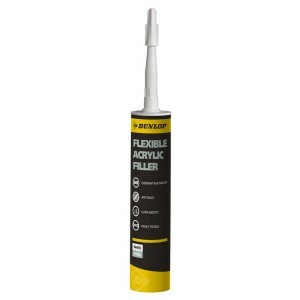 Read my Review Of Dunlop Pro Decor Flexible Acrylic Filler Caulk here. And if you would like to buy some for yourself you can buy Dunlop Pro Decor Flexible Filler caulk from here.